Steve and Margie Schnell with Stevie, Elecia, Ariana, Nathanael & Jadon Contact them now during their time of furlough at: schnell-family@hotmail.com. 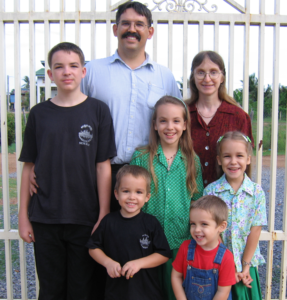 We came to Cambodia in 1998 and are involved in Church planting, Bible teaching and translation. Our dream has been seeing indigenous churches established that could and would carry on the work of evangelizing. We planned to start in the provincial capital of Kampot. Beginning in the major urban centers seemed like the best plan. While we believed strongly in indigenous principles, to labor all these years and still see nothing significant in Kampot city left us tempted at times to try and buy land, buildings, or give financial aid. God never allowed us the freedom to go down that road, but rather God had us wait for Him to work in the hearts of the Khmer. Responsiveness seemed to be in the countryside where we have seen a few small, fragile churches started. Aside from the areas we were working in, other small assemblies that were not the result of our labors would come and ask to study the Bible with us. They too were from rural villages, and they were like sheep without a shepherd. We invited them to study with us, taking care how we taught. We tried from the very beginning to instill love and wonder for the Word of God so that they could feed themselves. They would say, “You give food for the spirit instead of food for the flesh.” Since we did not give handouts or aid, some met with us only a few times. We did not forget that God’s Word never returns to Him void and that it accomplishes what He wills, but we wondered if there would be much fruit from the time spent teaching all these groups. At first we did not see what God was doing. Little by little He was opening the eyes of a few small churches. Some were churches we saw planted and some were from the areas that only received teaching. When a Cambodian society of Christians tried to threaten, bribe and cajole all Khmer Churches into joining under their banner, these few dirt- poor village preachers opened their Bibles to show why they would not and could not compromise. These little churches are small and far from perfect, and it is still early to tell for sure, but it appears we have the beginnings of a few indigenous churches. They are taking what they have been taught and are teaching it to others. They are learning to trust God and to serve Him through personal sacrifice, without thought of compensation. The way has not always been easy. Many times we felt like throwing in the towel, but the never-changing Word of God always pointed the way ahead. We don’t know if the churches mentioned in this report will be there a year from now. That is how fragile things are. This is a Buddhist country and is a territory still held firmly by the enemy. The thing we need most is prayer— fervent prayer of the righteous. Pray for these churches and for us, that we will all be strong in the Lord and learn to walk with Him by faith.